It’s like coming home again only better. When I first entered the gardening world, I lived in an apartment with a southern exposure. So I chose to grow succulents. This was back in the early 1980s, when unusual plants were hard to find locally. So I ordered them through the mail. With a check. In an envelope sent through the U.S. Postal Service. Fast forward 30 years, and I’m back at it. Things have changed, needless to say. I don’t have to mail checks to order stuff anymore; I can do it online. There are many more varieties available. And since I’ve discovered Ted’s Greenhouse, I can get a huge selection by car. 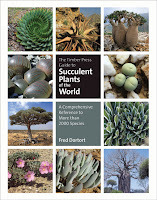 I still have some of my old books on the subject, but I’ve fallen in love with a new one: The Timber Press Guide to Succulent Plants of the World by Fred Dortort. It’s broken down by types of succulent, and gives lots of details about where they originated—an extremely important thing to know when it comes to growing any plant well. If you have a craving for plants with chubby, “windowed” leaves that range in shape from pebbly to spiky to spiraled or rose-form, the world of succulents is something you should explore. And the best way to explore it besides seeing these wonderful plants in person is to pick up a copy of The Timber Press Guide to Succulent Plants of the World. The photos alone tell a fascinating story. Adenium socotranum could fit comfortably into a Dr. Suess book. Kalanchoe synsepala could be mistaken for a delicately-fluted porcelain bowl. And Conophytum wettsteinii looks just like a pile of green buttons. And who knew Aloe could be anything but ho hum? 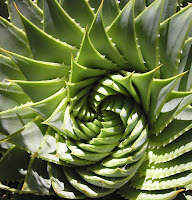 Take a peek at page 264 for a photo of a left-handed Aloe polyphylla, probably one of the weirdest yet most beautiful shapes in the succulent world. I used to be able to grow Lithops and even get them to bloom. But for some reason I’ve lost my touch, killing two of them over the past year. These tiny plants, often referred to as living stones, thrive in the most inhospitable locations in African wastelands—hot, dry and exposed. They survive these conditions by hunkering down into the ground with just the tops of their leaves exposed. Lithops have tiny “windows” that let in differing amounts of light in order to power their photosynthesizing interiors. 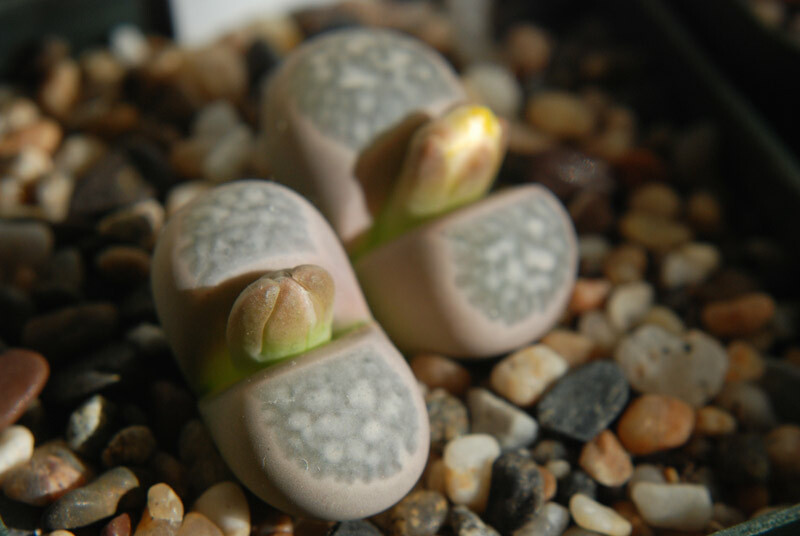 While they are not the only plant that uses the “window” system, Lithops also are able to develop the colors of their surroundings, and range from bluish-gray to brown to orange. A good resource for photos and information is the San Francisco Succulent and Cactus Society. The Midwest Cactus and Succulent Society will have its annual show at Cleveland Botanical Garden on March 19 and 20, 2011.